As it’s been a year since I started my PhD and not long since I finished my first experiment, I thought it was time for another blog update. My PhD began, as most do, with lots of reading, planning and training. Once I knew where I wanted to focus my research, I could start thinking about how to find the answers to the questions I'd set myself. I’m lucky to be based in Cairns with the Great Barrier Reef (GBR) just off the coast. The GBR might be most famous for the beautiful coral reefs stretching 2,300 kilometres along the Queensland coast, but it also contains one of the world’s largest seagrass ecosystems with meadows that cover more than 35,000 square kilometres and contain 20% of the world’s species. These seagrass meadows are found in a variety of habitats, from banks that are exposed at low tide, all the way down to a depth of 60 meters. You might not think a dive on a seagrass meadow sounds quite as interesting as a reef dive, but if you look closely in the swaying seagrass blades you’re sure to see a fish, or maybe a whole school of fish, that call the meadow home. These smaller seagrass residents draw in larger predators, big fish and even sharks that cruise around the meadow looking for their next meal. And of course there’s the ocean vegetarians who come to the meadow for a quick snack or to hang around and chomp on the seagrass leaves, these herbivores may be small shrimp, fish, sea urchins or larger herbivores (megaherbivores) like turtles and dugongs. We know we have lots of different herbivores chomping on seagrass in the GBR, but we don’t know much about the impact these grass lovers have on the meadow - so I wanted to try and find out how much seagrass is being eaten, and who is eating it. To understand how grazing is affecting the meadow, you need to see what the seagrass would look like if the herbivores weren't there. So I set up small exclusions to protect the seagrass from being eaten; large cages kept the turtles and dugongs out, small cages covered in fine fishing net kept the fish and urchins out and chemicals deterred the small shrimp (these guys are mainly eating the seaweed growing on the blades and not the grass itself). I used these exclusions in different combinations to keep out some or all of the herbivore groups and had control plots, which all the grazers could feed on, to compare the seagrass inside these exclusions - this means I can understand the impact the different herbivore groups have on the seagrass meadow, and what their combined impact is. I set up my experiment at two locations - Green Island off the coast of Cairns and Gladstone which is further south. 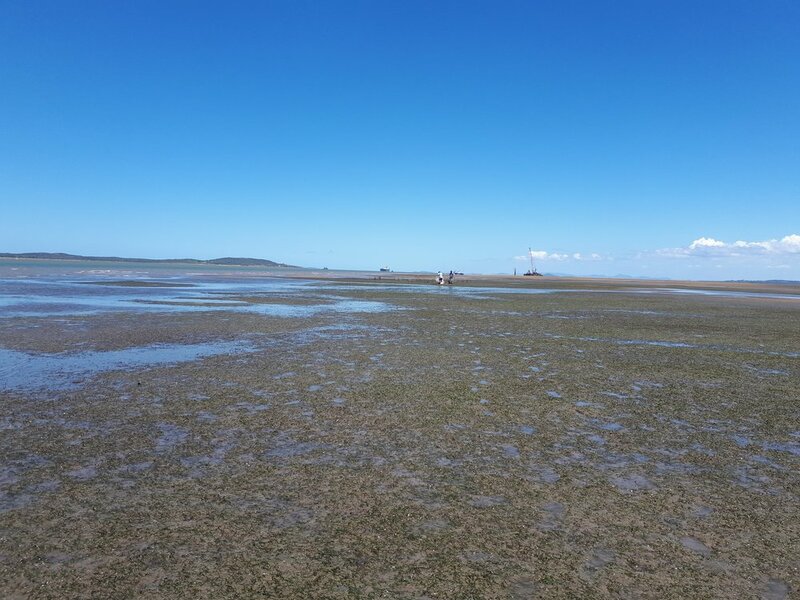 The seagrass at Green Island is in three meters of water with long grass and meadows made up of lots of different species, whereas the seagrass at Gladstone is on an intertidal mud bank, so it's shorter, and is dominated by one species. There are plenty of turtles at both sites and there are also dugongs in Gladstone Harbour - I haven’t actually seen a dugong yet but I have seen plenty of the distinctive trails they leave through the seagrass meadow as they feed. Green Island was the first site to be set up, I got all the equipment into the water and all my initial data collected with the help of my amazing lab dive team. We returned 2 weeks later to check on the experiment and found the small exclusion cages were really overgrown with seaweed, so we decided to come back a week later to clean them again. Unfortunately they were still very dirty after a week, and the light logger showed that the light levels had halved inside these cages within a few days (as the seaweed growth was so fast), so I decided I had to pull the small cages out as the reduced light could have been affecting the seagrass. It was a shame to lose a big part of the experiment, especially as you could see the bite marks everywhere from where fish had been eating the seagrass, (so it seemed like fish herbivory might be important here), but I decided it would be better to put them out at another time when I could clean and change the cages at least twice a week. I continued the experiment with the rest of the exclusion treatments, but nothing seemed to be happening for the first two months, the seagrass always looked long and lush in the whole meadow - both inside and outside the cages. Then, after two and a half months, we arrived to check on our third and final site, and we could see bare patches where the seagrass had been eaten all around the large cages, you could see from the surface the green squares of seagrass where the cages were protecting the seagrass. We jumped in the water to take a closer look and could see the seagrass had been cropped across the whole site, it looked very much like turtles had been through my site eating much of the seagrass around the cages. They had just focussed on this relatively small area - despite the fact there was plenty of seagrass in the meadow all around it! We did see turtles at the site from the boat, but we didn’t see any while we were diving, so we couldn’t be completely sure it definitely was turtle feeding, and not some other disturbance, that had caused the seagrass declines. So when we returned to the site two weeks later, I set up a go pro to film one of the cages while we were working at another site, and it was one of those rare occasions where the technology worked perfectly and I got the exact footage I was hoping for on the first go. The footage is below and this same turtle came back multiple times, over the course of an hour it was grazing in this spot for at least 10 minutes which is really cool to see, I also caught some of the other marine life in the meadow on camera including fish and a couple of blacktip reef sharks cruising around. This just shows the dramatic impact turtle feeding can have on the meadow, as when we started the experiment the seagrass was the same across the whole area! Green turtle feeding around exclusion experiment at Green Island. Blacktip reef sharks caught swimming around my seagrass herbivore exclusion experiment at Green Island. Gladstone was the second site to be set up, and thankfully I didn’t have a problem with the small cages fouling up here so I ran the full experiment for 3 months as planned. I did have to change out these small cages every fortnight and painstakingly clean off all the seaweed before I put them out again, but the fouling wasn’t really affecting the light levels inside the cages which is good. The currents in Gladstone Harbour are strong so I had to secure the equipment very carefully to ensure it stayed put, fortunately nothing got washed away, but a few small cages did fall over if they lost one of the poles holding them up. 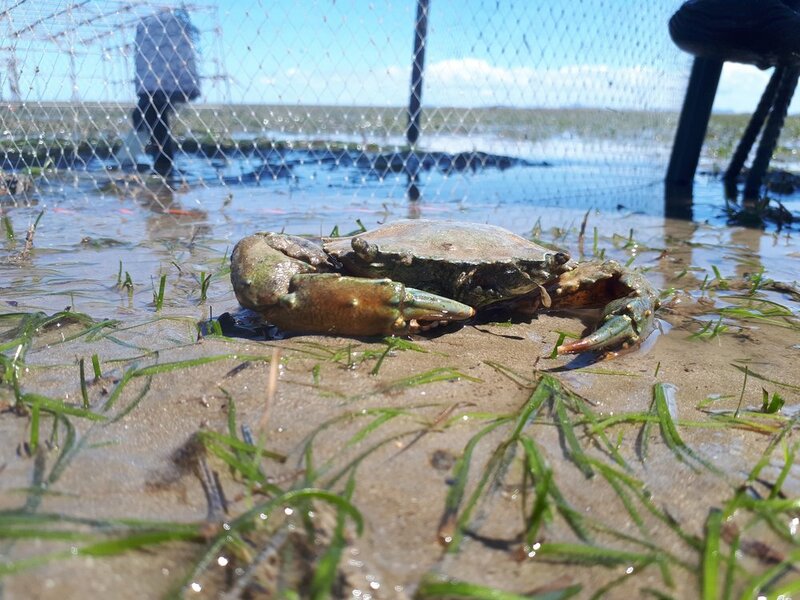 The biggest problem was the crabs who thought the cages seemed like an excellent place to hide and dig a burrow, we would evict them from their new homes every 2 weeks and it seemed to limit the amount of damage they could do. At Gladstone we noticed more of a gradual change inside and outside of the exclusion cages, compared to the sudden change at Green Island, initially the seagrass inside the small cages appeared longer, then we noticed the same in the large steel cages. We saw turtles from our boat while waiting for the tide to go out, so we know they were feeding in this meadow, and at the end of the experiment we saw a dugong feeding trail very close to the cages, so there had obviously been a dugong feeding there very recently. We weren't sure whether the intertidal seagrass would be more limited by the fact it's exposed at low tide than the fact it's being eaten, so it's really interesting to see longer seagrass in most of the treatments compared to the surrounding control plots. As I deployed all of the different exclusion cages at Gladstone, once I have all my data, I will be able to understand the role of all the herbivore groups in this meadow individually and in combination. At the end of these experiments, I took measurements in the field and samples of seagrass to analyse in the lab. I will need to process all of these samples and analyse the data before I can draw any firm conclusions from the experiments beyond my field observations, but it does certainly seem like there could be some interesting results! You can see in these photos below from the end of both experiments that it looks like there is a difference in the seagrass inside and outside the cages. This experiment also shows there are different types of megaherbivore grazing at both of these locations, at Green Island the turtle feeding is more intense and focussed in a small area, whereas at Gladstone the megaherbivores tend to feed in the whole meadow. 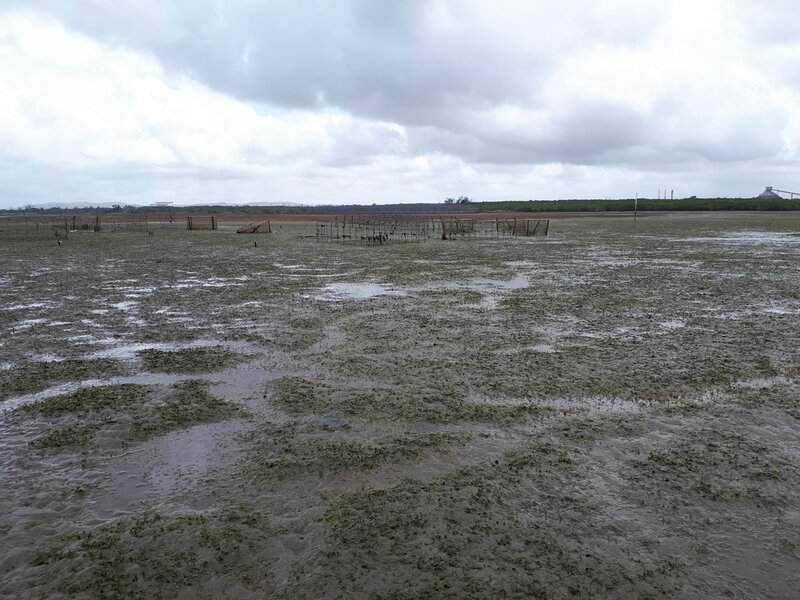 It does seem like the herbivores are having an impact at both seagrass meadows, but now I need to lock myself in the lab for a few weeks to find out for sure….